While I had installed Oracle Java on Ubuntu 10.04 weeks ago I hadn't had time to install the Java plug-in so Mozilla Firefox could display Java applets even though this is a piece of cake. And since today I had planned to, finally, configure Firefox on a recent fresh install of Ubuntu Lucid Lynx to my preferences I started with Java. Note that after the backslash no space should follow, just press Enter. Or you can omit the backslash and just type everything on a single line. Important: this only works for the 64-bit version of Ubuntu, Oracle Java, and Firefox. After this command I restarted Firefox again and verified that Cyber Balls animation Java Applet now showed up. And indeed the simple animation I wrote nearly 15 years ago worked. 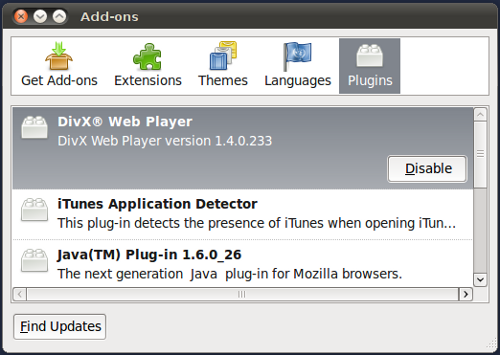 The Oracle Java plug-in as reported by Firefox. When I opened the Add-ons window via the Tools menu and clicked the "Plugins" tab (right most) the Oracle Java Plug-in showed up in the list of installed plug-ins. Java - has links to several applets I wrote years ago.